Your choice of indication: When you choose wireless, you can choose our wireless HH2400 hand held indicator. It has maximum portability, ease of use and displays all platforms plus the total weight. Your choice of indication: When you choose wireless, you can choose our wireless M2400 full laptop computer system. Unit shows all weights on the screen at the same time and has full MAP capabilities with print out capable software. Easy to use, portable and operates on the laptop power supply that can last for hours of use. Our standard platform can be used for dual wheel applications as shown. Here is a Lear Jet being weighed on our standard 3 platform system. 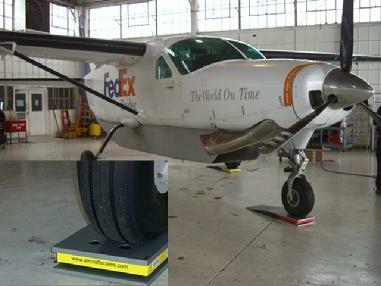 Larger aircraft tires can fit on our platforms. Each platform is 12 inches wide by 16 inches long. This size fits 95% of the aircraft in the weight range of our small platforms. You can also "double up" on our platforms and use them side by side (additional platforms required). Our 10,000lb platforms are made from solid 6061 aluminum. Each set comes complete and ready to use. Ramps are 30 inches long on our 10,000lb and 15,000lb platforms and 16 inches long on our 2K and 5K units. NIST traceable calibration and complete instructions. Both of our platform units are easy to set up, use and transport. 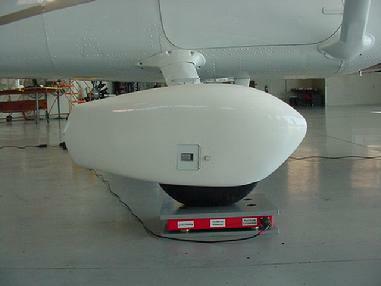 Just set the pads in front of or behind the aircraft wheels, pull or push the aircraft onto the pads. 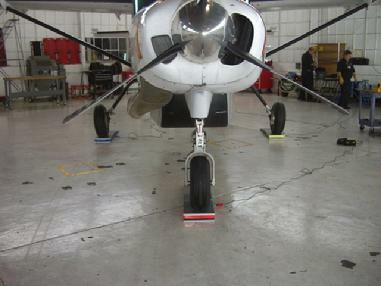 If you do not have a tug, no problem, just jack the aircraft and slip the pads under the wheels to weigh the aircraft! Here is a Piper Navajo on our wireless system, easy pull up, wireless operation "No Wires" order our HH2400 series for our hand held units or M2400 for our laptop computer series read out.